Effective January 1, 2019, Michelman is pleased to extend its distribution agreement with Safic-Alcan, an international specialty chemicals distributor, to Central Europe, Poland, and Turkey. 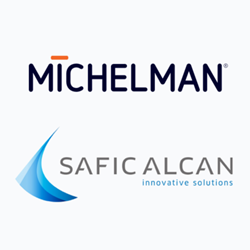 Effective January 1, 2019, Michelman is pleased to extend its distribution agreement with Safic-Alcan, an international specialty chemicals distributor, to Central Europe, Poland, and Turkey. Capitalizing on the success that Safic-Alcan has had in France and the United Kingdom distributing their broad range of coating additives, surface modifiers, and paper & packaging coating solutions, Michelman will now have them manage their distribution throughout Safic-Alcan subsidiaries located in Poland, Czech Republic, Hungary, Serbia and Turkey. “Safic-Alcan is well known for its high quality of service and strong technical support and we are excited to extend our partnership to include the Central European market and Turkey. This initiative will enable us to enhance our presence in this region” added Paul Griffith, Chief Marketing Officer, VP & Managing Director EMEA, Michelman International SARL. Michelman will co-exhibit with Safic-Alcan at the European Coatings Show 2019 in Nuremberg, Germany, March 19 - 21, 2019. Visit both companies in Hall 7, Stand 7-423. SAFIC-ALCAN is a French independent distributor of specialty chemicals headquartered in Paris-La Défense (France). The Company develops and provides wide ranges of polymers, materials and additives for the rubber, coatings, pharmaceuticals and cosmetics industries. The Group is present in all major countries of the European Union, as well as in Turkey, and China with on-going strategic development in Eastern Europe, the USA and Mexico. In 2017, Safic-Alcan posted sales revenues of 565 M€.